Let’s take a look at the state of affairs in the Big Bear real estate market as we head into summer... May is typically a good ‘spring season’ indicator month and can also shed light on what to expect of the upcoming summer selling season. This May was very encouraging from a price perspective, as the average price of all residential property sold in May 2014 compared to the same month last year, increased 19%. 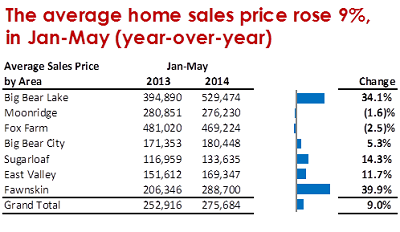 Year-to-date through May, compared to last year, the average price is now up 9% in total. (At the end of April the average price was up 6.6%, so substantial price gains were seen this May) Most of these price gains have come from high-end sales in Big Bear Lake area. However, Sugarloaf has also seen above market appreciation so far this year as well. Transactions however tell another story. 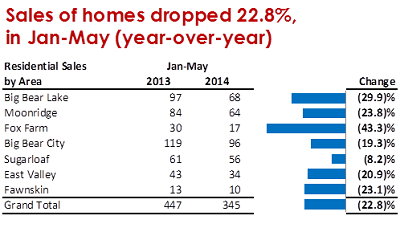 Closed residential sales in May were off a staggering 39% from last year. Closed sales year-to-date through May are off 22.8% and this, coupled with a 56% increase in supply from last year, indicate that buyers currently have the upper hand. There are currently 635 active listings on our Big Bear MLS vs. 554 last month and 405 this time last year. So, what are we to make of this topsy-turvy market? Transactions have slowed for a number of reasons, but the fact there are very few foreclosures available and that investors have pulled back explains much of this ‘new’ market (I hesitate to call it ‘normal’ at this point.) Traditional buyers have taken a front seat and, overall, I think this bodes well for the market in general and for its continued effort to become more healthy and more stable. It will be interesting to keep an eye on the supply side. If we continue to have roughly 7.5 months of supply (a.k.a. a buyers market), we could see some downward pressure on prices before too long. Many sellers seem to be ‘testing’ the current market and some are becoming frustrated with the extended time-on-market we are seeing more regularly now. Multiple offer situations and bidding wars are very ‘last year’ and are not at all as common now. That said, with the right marketing, well-priced homes are still regularly seeing good offers. It feels like we are in the middle of a standoff currently, so we’ll have to stay tuned to see what gives in the coming months. Will transactions pick up and prices continue to hold? Or will this slow spring season take back some of the substantial price gains we have recently experienced? Most experts feel that there is little chance of prices going down overall. Perhaps the market will continue to bounce along against a ceiling in the coming months. I do know that with the right combination of marketing and pricing, we have been providing great results for sellers here in Big Bear. And there are some great homes available to buy. So, let us know if you have questions on ANY homes you see for sale here in Big Bear. Until next time, all the best and Happy Hunting. Posted in 2014 Posts on June 13, 2014 by Mike Sannes.